As spring thaws our rivers and wetlands at last, this is a good time of the year to begin prepping to manage one of our most aggressive wetland invaders. Two beetles of the Galerucella species are effective at controlling loosestrife populations. Their larvae feed on the plant, stunting its growth and spread. Collect purple loosestrife plants in the spring and introduce beetles in a contained netted environment. Because these beetles feed on the netted plants, they multiply before release throughout the summer. Plant the loosestrife with their beetles into your wetland, stream or lake that is surrounded by unaffected loosestrife plants. The beetles then spread to surrounding plants reducing their vigor and reproduction. As you establish beetle populations; they can prevent the spread of purple loosestrife across your property and beyond. Report when you find a population of loosestrife. 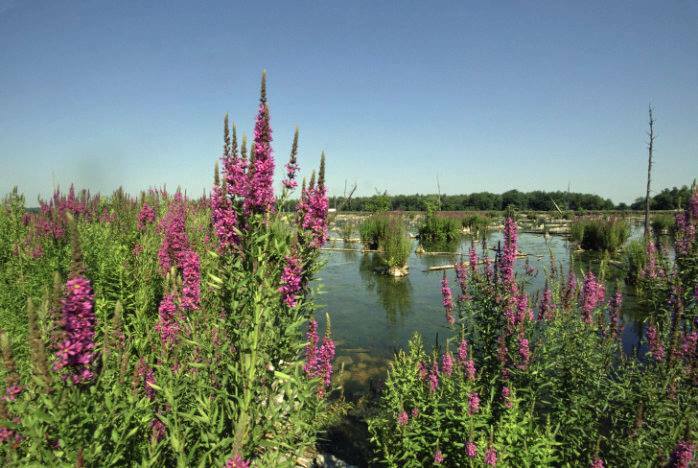 Attend the Purple Loosestrife Biocontrol Training at Beaver Creek Reserve’s Citizen Science Center on Tuesday, April 16th, from 6-7pm. No sign up necessary!